Almost all processed or packaged products are moved on a conveyor at some stage in their life cycle. 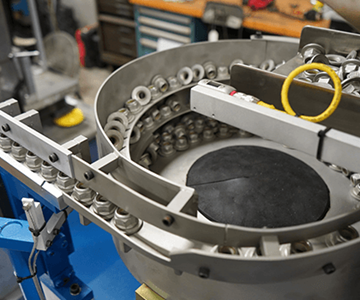 There are several types of conveying methods that can be used to move a product efficiently in order to maximize throughput. Versatile, diverse, and effective material movement. Conveyors are designed to move material or products and improve efficiency and throughput. Conveyors are used in a variety of industries including material handling, metal working, industria, food processing, distribution, cosmetics, medical and pharmaceutical, plastics, packaging, automotive, and much, much more. 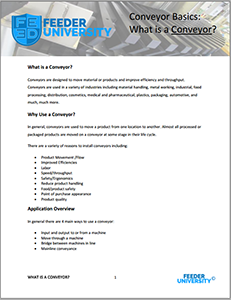 Keep the highlights of Conveyor Basics close by with this downloadable whitepaper, so you can stay informed. Brought to you by Dorner. What are the different types of conveying methods? If you need assistance selecting the right conveyor for your process or want learn more about conveyor styles, contact the experts and application specialists at Dorner! The role of process automation is rapidly increasing in nearly every industry. Feeder University strives to empower students, engineers, purchasers, technicians, and others with the information it takes to make sense of it all.